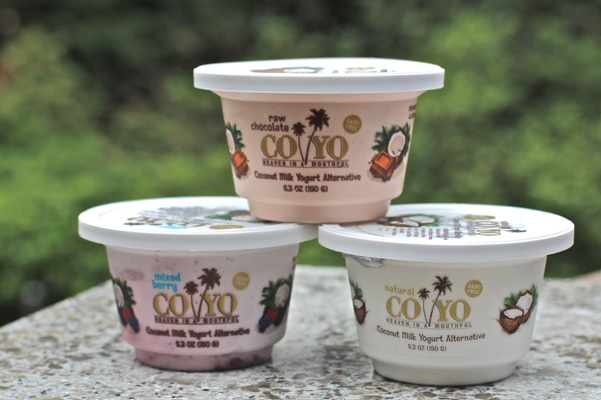 Product Description: From the manufacturer: “CO YO is a creamy delicious alternative to dairy yoghurt made from the creamy milk of the coconut with plant fed Probiotic cultures. CO YO is made from the freshly squeezed cream from the whole flesh of the coconut. 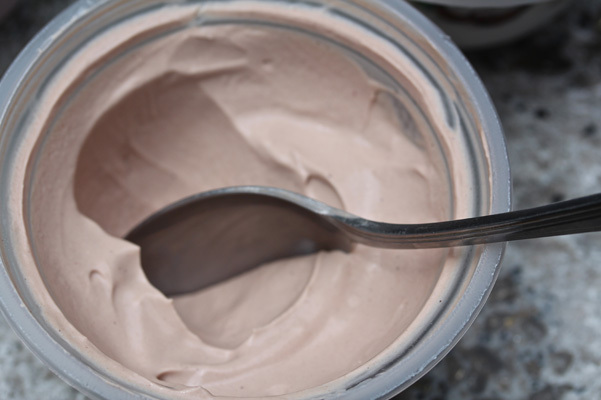 98% pure coconut – in fact, it takes more than one whole coconut to make a small tub of CO YO. Mixed Berry label: Coconut Cream, Mixed Berry (Apple Puree Concentrate, Puree of Blackberry and Raspberry, Water, Puree Concentrate of Raspberry and Strawberry, Natural Flavor, Pectin, Sodium Citrate, Fruit and Vegetable Juice (for color), Calcium Chloride), Stevia, Tapioca, Pectin and Probiotic Cultures. 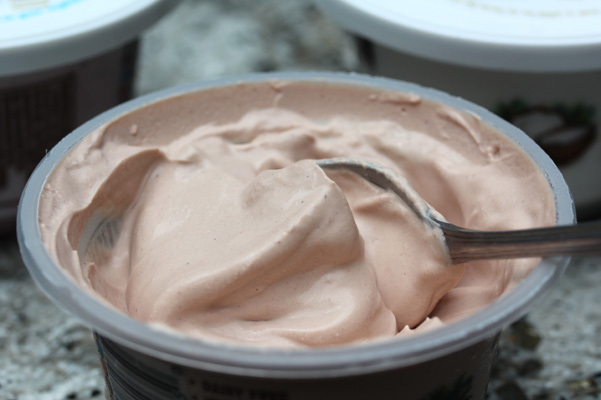 Test Kitchen Overview: I came across CO YO at the Summer Fancy Food Show in NYC and it was love at first bite. And let me tell you how shocked I was because it is sweetened with stevia. And I cannot stand stevia. It truly tweaks my palate and I do not eat anything containing it. I took a bite of the Natural and was immediately struck by the luxurious texture and the very lightly sweetened and balanced flavor profile. And then I learned it was sweetened with stevia. Okay, live and learn. I would not have tried it if I had read the ingredients first. I took another bite and then, upon looking for it, detected a faint stevia-like taste, but the product was so fabulous, I didn’t care. This was a coconut milk yogurt I wanted to learn more about – and taste again. The Raw Chocolate intrigued me and I sampled that next and decided this could easily be a dessert treat for me. I asked for samples to be sent so that I could bake with it and you can see those results in our Gluten Free Lemon Coconut Yogurt Snack Cake. Pros: Unparalleled texture. Satiny. Thick, but not gloppy thick like some Greek-style yogurts. Just pure luxury. Fabulous flavors. The Raw Chocolate and Natural are our faves. I hope you can see the amazing texture from these images above and below of the chocolate flavor. Cons: Availability. For now this might be hard to find. Go to your local natural food store and advocate for them bringing it in. I apologize for getting you all excited about a product that has such limited availability but it is so fabulous I am sure that will change soon. (They are adding new locations constantly and the website is not yet up to date. CO YO is now available at Sprouts Farmers Markets, Earthfare, Haggens, Central Market and select Whole Foods, in addition to other locations). Where to Buy: Use the LOCATOR function at COYO.us.